Ah, memories! Some good, some bad and some terrifying! In this case, 10-years after the global financial markets came close to collapse, the word terrifying would seem to be a good fit! But what went wrong in 2008 and is it possible the same could happen again? To my mind, one word seems to describe the environment that existed in 2008 whether thinking of the consumer, banks or any variety of other corporations. The thinking back then that went into the decision-making process of all who were involved in the real estate market whether buyers, traditional mortgage lenders, subprime lenders, banks, property speculators, rating agencies all the way down to unsophisticated governments around the world seems, in retrospect, to revolve around the word greed! The basic thinking of most if not all involved was that real estate prices could only go higher which in essence, the masses believed, would cover for much if not all of the cracks in the foundation. But low and behold it was painfully discovered that prices CAN go lower bringing on the 2008 collapse that led to foreclosures, bond defaults, banks on the verge of going under then deemed to be too big to fail (TBTF), personal bankruptcy filings, corporate bankruptcy filings and so on and so on. Pre-Crisis Thinking On Mortgage Securitization: Spreading The Risk…Or Increasing Exposure! 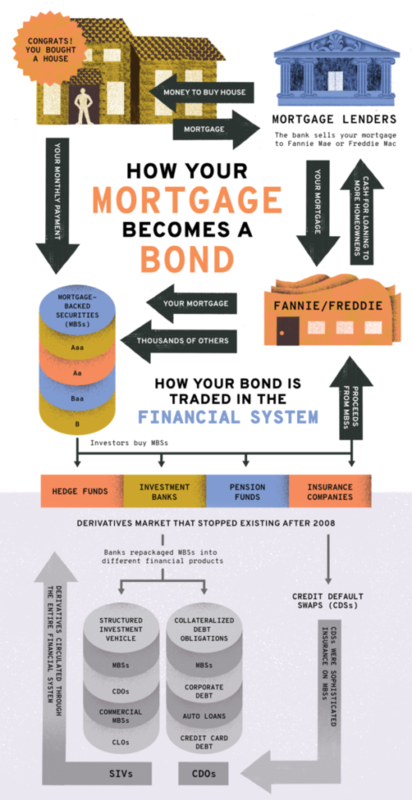 ‘…Fannie, Freddie, Ginnie, and investment banks buy thousands of mortgages and bundle them together to form bonds called mortgage-backed securities (MBSs). They sell these bonds to investors—hedge funds, pension funds, insurance companies, banks, or simply wealthy individuals—and use the proceeds from selling bonds to buy more mortgages. A homeowner’s monthly mortgage payment then goes to the bondholder. So how and why were the lending standards ‘permitted’ to decline to the point where any decline in the underlying asset, the homes, would be enough to create a devastating boulder from a snowball rolling down a hill? ‘…companies built homes so quickly they outpaced demand. The result was an oversupply of single-family houses for sale. Mortgage lenders, which make money by charging origination fees and thus had an incentive to write as many mortgages as possible, responded to the glut by trying to put buyers into those homes. Who can forget the saying in the early 2000’s that if you could fog a mirror, you could get a mortgage. Liar loans, mortgage underwriting by which the borrower gave their financial background with no actual validation, proliferated. 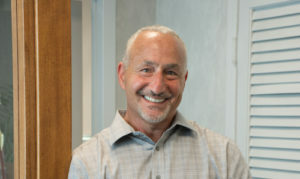 And if a buyer would not, under historically ‘normal’ underwriting techniques, qualify or be in a position to afford a mortgage loan but got one anyway, the thinking of all involved in the process was that the price would go up and the buyer would be able to flip it for a profit in a month or two. ‘…Early-stage mortgage delinquencies started piling up in 2006, with the delinquency rate on subprime ARMs going from roughly 12 percent at the beginning of 2006 to well over 20 percent by 2008. It peaked later, in 2010, at almost 30 percent. Cash-out refinances, where homeowners refinance their mortgages to access the equity built up in their homes over time, left homeowners little margin for error. When the market started to drop, those who’d taken money out of their homes with a refinancing suddenly owed more on their homes than they were worth. Instead of making their monthly payments, these people defaulted on their mortgages. As the panic and financial carnage spread in 2007-2008 and beyond, financial institutions stopped providing necessary liquidity to each other, with terms like Libor, credit crunch, risk premium, credit default swaps, counterparty risk and interbank lending becoming prevalent in the daily lexicon of people who had never known that these terms existed. Federal Reserve, monetary policy, fed funds and quantitative easing also became well known from their previous relative obscurity. Housing prices sank, AAA-rated mortgage-backed securities tanked and went into default, personal and business bankruptcies soared and iconic institutions either disappeared or were gobbled-up by stronger ones. Individuals lost life savings, retirement funds and livelihoods while savvy investors like Warren Buffet made fortunes. As the Federal Reserve pushed interest rates to zero, the economy stabilized, the stock market started a new bull run, real estate came back and in some locales soared to record highs, businesses began to recover as did the job market. Now, in 2018 and 10-years removed from the throes of a very bad time, consumer credit is at all-time highs, consumer confidence is soaring, the stock market has hit record territory, housing is stable with a lack of supply supporting prices and, all is seemingly well with the world. But global challenges remain and, as we know, history tends to repeat itself in some form. And when any asset class is considered to be only one-directional in terms of price and value, bad things can and typically do occur. Cryptocurrency as a recent example was considered by many to be an unstoppable force, with Bitcoin as a proxy topping out near $20,000. It was said by some and believed by many, that it would keep rising to $100,000 per Bitcoin. This led people to borrow on high-interest credit cards to get involved. That one-way trade has since collapsed like a ton of bricks with Bitcoin, an asset with no discernable fundamental value, currently being traded at about $7,000. The moral of the story is that while history may not repeat itself for a long time, people, whether investors, homebuyers or speculators, need to understand that there are risks inherent in every decision that we make. Some risks, of course, are greater than others and a decision should always be made after considering a variety of inputs, and not made solely based on GREED!